There is cause for excitement when talking about corn today in North Dakota. We are experiencing what will likely be a state record yield by several bushels per acre, with generally great harvest conditions. In the week ending October 23, 2016, according to USDA crop progress data, we are 39% harvested with corn in North Dakota, behind last year’s pace by 17%. 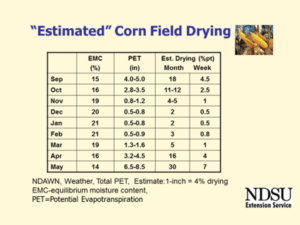 This is very nice progress, however, there are a few issues that have become prominent in the past week that I want to address, namely corn drydown and storage issues. So there you have it from an expert in storage at NDSU. There is no easy solution and they all involve work and monitoring. The bottom line is to be sure you know the risks associated with the storage options you are choosing.